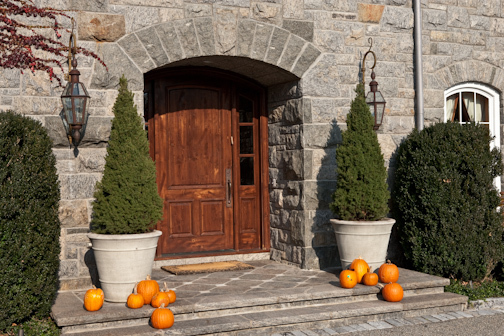 Main entrance to home with granite arch. The arch is composed of complete "through stones" and custom cut corners. Approach angle from front driveway area. Landscape walls with Hillburn Granite(TM) in the foreground with front of home in background. Each pillar is made of one solid piece of stone, hand cut Hillburn Granite. shows granite sills, window arches and pillow-faced granite veneer installation. Granite veneer installed on home. Arch stones on pool cabana are complete "through stones" - full thickness running solid from front to back forming a true arch. Portico arches, granite pier caps and granite flatwork on back patio. Flatwork is thermaled top-surface. View of granite arches with full thickness stone forming the arch and full corner / return pieces on the piers. There is no joint on the corners, granite pieces are cut from one piece of stone with angle to wrap around the pier. Veneer installed on rear of home showing window header. Full, through-pieces of granite to form true arch in driveway portico porte-cochère. Legacy Stoneworks artisan stone veneer installations enhance a unique architectural detail.